FROME’S Person of the Year 2017 award has been won by charity fundraiser Rachel Clark. Hundreds of votes were received in the competition, which was organised by Frome Times to find the person who has made a real contribution to the community in 2018. In memory of her mother, Shirley Wiggins, who died in 2011 from leukaemia, Rachel and her brothers, Matthew and Daniel, have raised over £26,000 for local charity We Hear You (WHY) by setting the town a fundraising challenge every year. Last year, Rachel organised the challenge for the most people to row 500m each, in a 24-hour relay, breaking the Guinness World Record with a total of 677 rowers. Rachel’s current challenge is to run a mile-a-day for 365 days, whilst encouraging other local people to run with her and raise more funds. She was also shortlisted last year in the ‘ITV Fundraiser of the Year’ category at the ‘Pride of Britain’ awards. Rachel said, “I was so happy to receive the call from your office telling me I’d won, overwhelmed in fact, because the calibre of nominations as you know was incredibly high this year! It’s an absolute honour to be recognised by the local public, their opinion really matters to me in regards to policing and fundraising within such a remarkable community. I love feeling part of it. “If I look back on when I was child at Selwood and Frome College to where I am now, I’m reassured that I made the right decision to join the police and hopefully be a role model to others. “The phone call to tell me I’d won was bittersweet, I still miss being able to tell my mum good news, she was always the first person I would share things with but I’ll keep going in her memory, I’ll keep fundraising for WHY, an incredible local charity and I hope I can keep on motivating others. 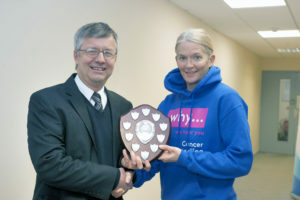 Ian Drew, editor of Frome Times, presented the winner’s shield to Rachel last week. Ian said, “Congratulations to Rachel on winning our Person of the Year award for 2018. It’s clear from all the comments we have received from voters that Rachel is a true inspiration to the community with her fundraising efforts and last year’s Guinness World Record helping to put Frome on the map. I feel she is a very worthy winner of this award. Other nominees were Mike Bishop, Marilyn Burrows, Lucia Chadwick, Gary Collinson, Harleigh Gomer, Andrew Lee, Alison Murdoch, Veronica Roberts, and Ryan Wheeler.